Welcome to Tamagotchi Village's Portal. The portal is the gateway to all of the Tamagotchi versions. 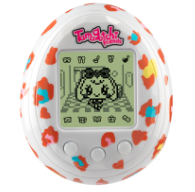 You can learn about the many different releases of Tamagotchi, their growth charts and happy items can also all be found here. These pages are regularly updated with the latest information, so check back often. The original Tamagotchi are the ones that were released in Japan at first in 1996 and were discontinued in late 1998. This section of the portal will show you growth charts, logs and various information about these vintage Tamagotchi. The modern Tamagotchi's are the ones that were first reintroduced with the connection and connexion series in North America and Europe. The section also includes the more recent English releases such as the Tamagotchi Tama Go, and the Tamagotchi Friends. This section is about all the Japanese releases since 2004, mainly the coloured screen Tamagotchi. The latest Japanese edition which is the Tamagotchi m!x can be found here with it's growth charts, and other various information. Please click one of the tabs above to find out more information.